Support full HD wireless audio and video transmission, support HDMI 1.3 HD output. Easy to use, the strongest and most stable of similar products. Support the miracast: Mac OS 10 and Above,IOS 8.0 or above, Android 4.2 or above,Windows 8.1 and Windows 10. Audio Format-MP1,MP2,MP3,WMA,OGG,AAC,M4A,FLAC,APE,AC3,AMR,DTS,RA,WAV and so on. Image Format-JPG/BMP/PNG/GIF and so on. *High-Definition Image-- Support 1080P, you can connect PC, smartphone or iPad to TV or projector, whatever you see on your mobile device's display, you can mirror onto the HDTV or projector, create your own exclusive cinema, enjoy different audio-visual feast. *Good Compatibility-- Compatible with Android 4.2 and Above, Mac OS 10 and Above, iOS 8.0 and Above, Windows 8.1 and Windows 10. Play games or share photos and videos with your family on big screen, without having to huddle around the tiny screen of a mobile device. Also, support multiple formats of photos, videos and files, out of the shackles of cable, the meeting has become intelligent and efficient. 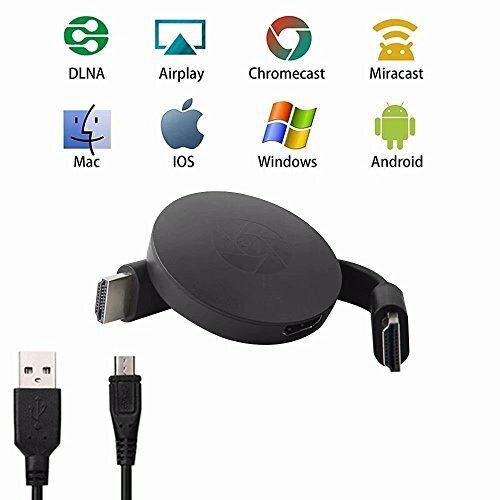 *Portable Design-- Rounded cute size, just like a cookie, with a magnet connected the HDMI cable on the back, which saves the space so that it is portable for you to use it anytime and anywhere. *Plug&Play-- Just plug and play, no needed any other drivers, and with a switching button, you could switch Airplay mode or Miracast mode easily. *Satisfactory Guarantee-- 1-year warranty,any problems,issues or concerns,pls contact us asap,we will reply yo within 24hrs,thanks! If you have any questions about this product by Ozvavzk, contact us by completing and submitting the form below. If you are looking for a specif part number, please include it with your message.